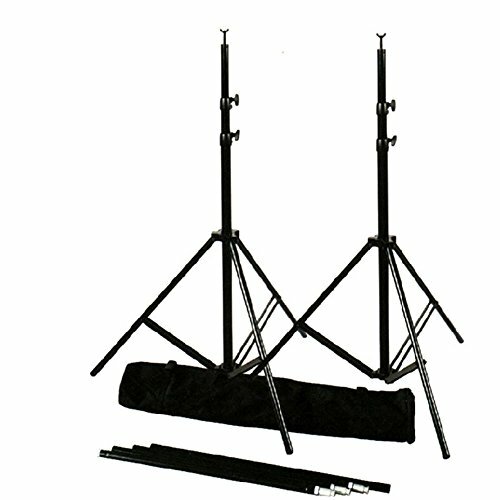 The RPS Studio RS-2000 heavy duty portable background support features metal collars and an aluminum crossbar and uprights with a black finish to cut down on reflections. The uprights have three sections. The diameter of the largest section is 1.4 inches, the middle section is 1.25 inches. The smallest section is 1.1 inches. The uprights extend from 41.5 inches to 111.8 inches (over 9 feet). The crossbar has 3 sections. It extends from 6.10 feet to 10.4 feet with a diameter of 1.25". Included is a heavy black nylon carry/storage bag that features hook and loop closures, an exterior pocket and carry handle.